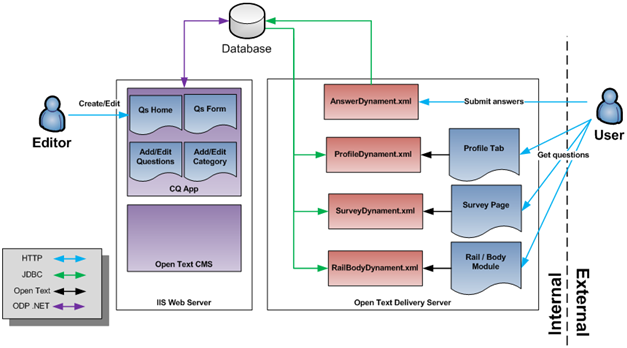 oshyn: Organic Profile Creation and Surveys in OpenText™ Delivery Server - Open Text Web Solutions Usergroup e.V. 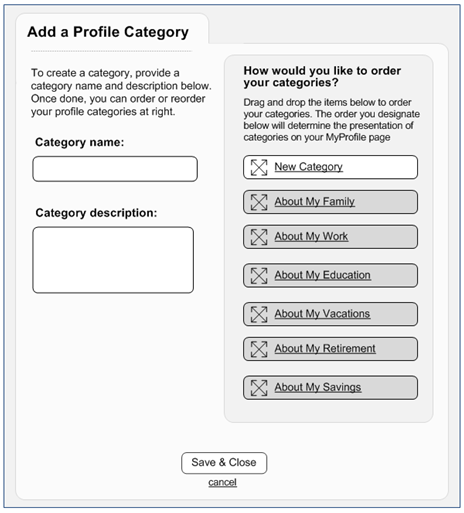 Organic profile creation (also known as Progressive Profiling) is a typical feature required by marketers who want to lower the barriers for obtaining a user's information. Marketing research has found that asking for information in smaller "bites" works better than asking for all the information on one, overwhelming page. We recently developed a custom solution in the OpenText (RedDot) environment that allows editors to poll users across various areas of the site to create their profile organically as the user browses to different pages. The requirements for this module were beyond what some existing modules could provide, which is why we developed a new one. The Rail and Body modules allow editors to poll users anywhere on the site. These modules are added to the side (vertical) and body (horizontal) sections of the site. Each module can hold up to 3 questions which are defined by an editor. 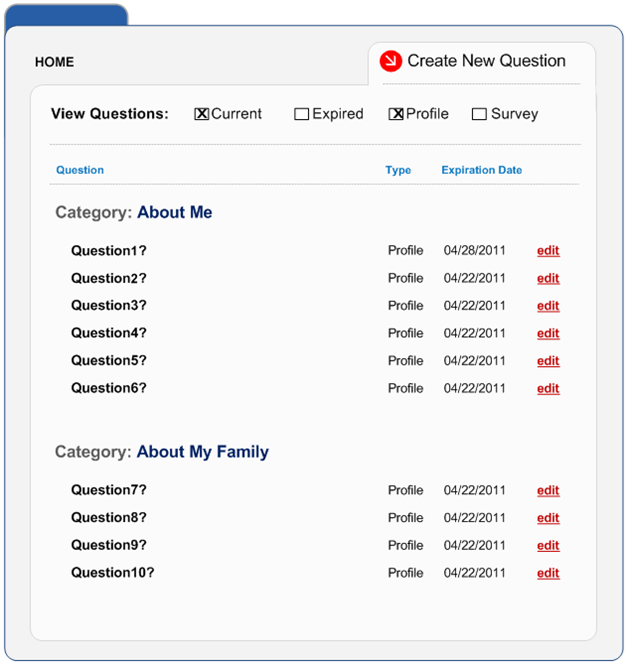 The profile section displays questions with the type ‘Profile’. Categories are collapsible and sorted by rank which is set by editors. Each category has an individual percent completion bar and there is also one at the top. Unanswered questions display in red. 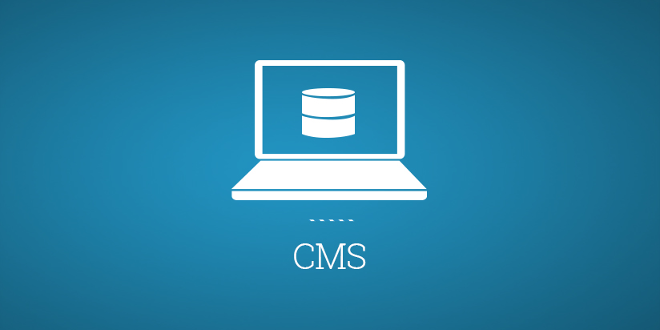 A custom .NET application resides on all editorial CMSs. This application will allow editors to add/edit questions and add them to modules on the site. Several dynaments will process question requests from the database and organize them in the required format for the style sheets. A single dynament will process all user responses and save them into the database. Question Format: Radio, Checkbox, Dropdown, Rank (Visually sortable list). Will provide success and already answered messages defined by editors. Global completion % and individual category completion % will be displayed. Unanswered questions will display in red. From here, the editor can choose to edit existing questions or create a new one. 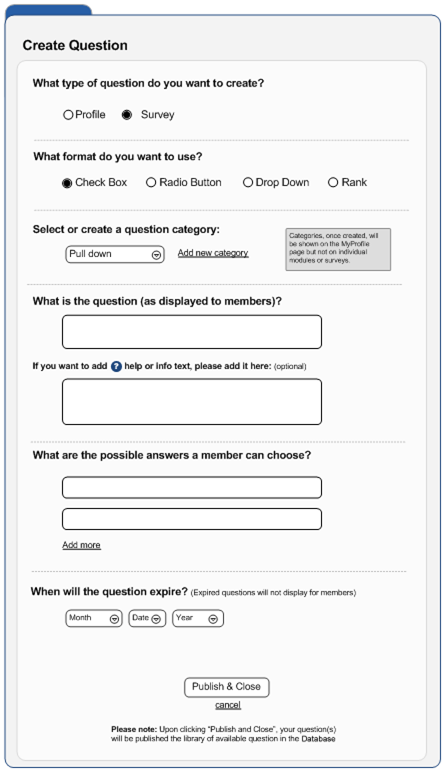 There are various sorting options that allow them to display different sets of questions: Current on Expired (based on system date) and Profile or Survey questions. 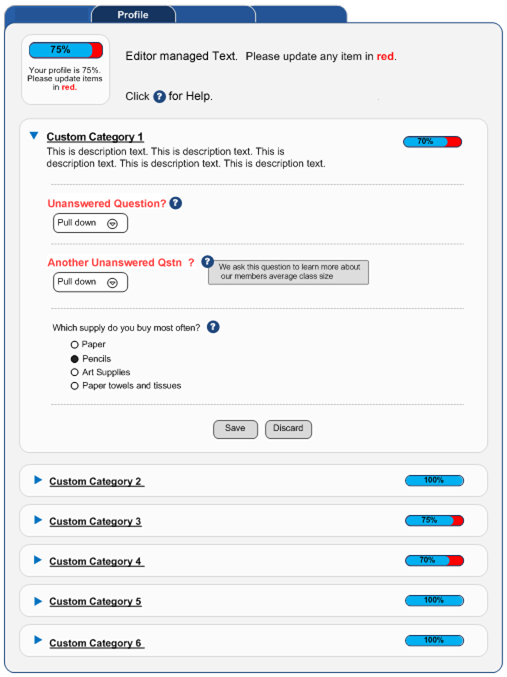 This allows editors to select various options of types of questions, the section they want them displayed on, expiration date, answers, help text, etc. An overlay will be displayed on the ‘Add Question’ popup if the editor wishes to add new categories. They can also sort them by dragging them on the right side. This will set the order in which categories display. We took an idea and built a simple, yet effective solution that allowed our client’s editors to poll users in their site.